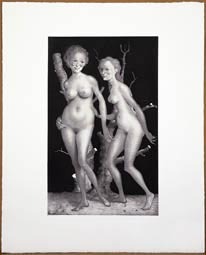 Jake & Dinos Chapman and John Currin – etchings from the Collection of Magasin 3 Stockholm Konsthall. "It's fascinating to see contemporary expressions presented in a traditional, classic medium, to follow an artist's work that relates to ones own oeuvre and to the work of others - to our history." David Neuman, curator for the exhibition, 2006. John Currin's etchings are based on his own paintings over a ten-year period, paintings that are often described as both historical and bizarre. The Chapman brothers have drawn over, added to and scribbled on one of the most prestigious works in art history, Goya's "Los Desastres de la Guerra". John Currin's paintings are figurative and technically skilful, focusing on the issues of composition and lines but his imagery is puzzling and irritating. One series of paintings depicts lightly-dressed young women, another ageing women, women in bed, and stereotypes of homosexual men. Jake & Dinos Chapman have processed their edition of Goya's prints "Los Desastres de la Guerra", replacing the victims' faces with clown masks, drawing swastikas all over an entire picture, adding details such as watchtowers, barbed wire and chimneys and mixing them with elements of childish humour. Goya's work is a series of etchings illustrating the invasion of Spain and the atrocities that Napoleon's army committed against the people, and the farmers' assaults on the soldiers. These pictures are often referred to as the first depictions of war without a romanticising note or an idealising agenda. The Chapman brothers claim to have a fascination for representation of the that which cannot be portrayed.